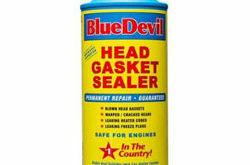 Gasket heads cost as little as $280 and as high as $600. I am also talking about $1200 to $4000 parts and labor cost in tearing your engine apart to find out the cause of your car’s leaking radiator or engine overheat. Why is my introduction jumps directly to the cost? 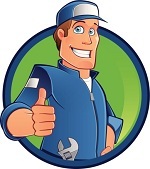 It is because a head gasket repair and, or replacement costs an arm and a leg. When you call around to get a price on fixing your ailing vehicle. 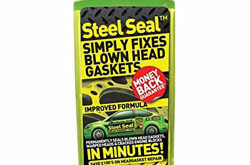 Whether it is Pep Boys, Mr. Tire, Midas, or your dealership, those are the figures you will hear from them to get your blown head gasket fixed. But, if you are looking for a more cut-rate price, getting it from salvage yards is your option. What’s Special About ATP AT-205 Re-Seal Stops Leaks? I have a 2012 Acura TL Type-S, which is a 6 cylinder. It may not be a standout vehicle, but it is pretty much a well-rounded style which I like. Before I bought my car, I checked consumer reports of Acura TL and It doesn’t have a track record of common head leak problems. Moreover, I have also had a Grand Cherokee that I use daily for work. So, I do not use this car very often. I started driving this car for a couple of weeks until I noticed a pesky oil leak on my garage floor every time I park it, and I never knew where it was from. Never really questioned it because my oil levels seem to indicate normal. Neither I and my sister had any firsthand knowledge of car repair. My sister’s boyfriend hinted that my car might have a blown head gasket. Little did we know that it is a very serious problem that has to be dealt with immediately. Essentially, a great performing sealer can save you time, money and give you peace of mind keeping fluids out of the engine after noticing a bad leak, engine overheat or white smoke coming out your exhaust pipe. The only time we should hand it over to a professional mechanic is when there are underlying problems diagnosed after the attempt of an easier solution. Just because a bad gasket is a crucial and labor intensive work, it means there are no other options left to prevent your engine from being taken apart. There are! 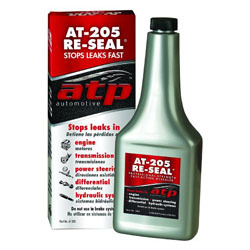 I know my car’s head gasket has a rubber-like coating on it, so this is when ATP AT-205 Re-Seal Stops Leaks was recommended to me. As much as possible, I try to avoid trying to carry out the repair myself or someone whom I am not a 100% sure savvy enough to check it. I purchased this product ( 8-ounce bottle) through Amazon for $10.34 since I really didn’t have the time to go to an auto store. With the help of my sister’s boyfriend, we added the ATP AT-205 Re-Seal Stops Leaks (according to how many quarts you have in your engine) during an oil change. I was skeptical at first because it says it takes roughly 5 hours for its seal to take effect. Petroleum distillate rubber conditioners are the components that often can turn rubber seals into a mush over time. Luckily, the product is non-toxic, and since it is not a petroleum-based formulation, it won’t hurt my Acura at all. 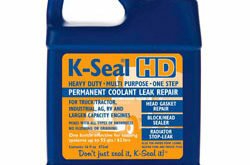 Moreover, I found out that this sealer can also stop the leaks in automatic and manual transmissions. Locker, conventional, and limited slip differentials,power steering fluids and hydraulic oils. The only incompatibility is to use it on brakes which are clearly highlighted clearly on its label. It’s been 5 months since I used ATP AT-205, and my car has been running in mint condition, I never noticed an oil drip again on my garage floor. It pretty much restores the pliability of the seal to a nearly new condition, so no more leaks! This stuff is an underdog for eliminating oil leak. I am really happy that it saved me a big amount of money. It may not be as popular as Bar’s Leaks and BlueDevil but works like a charm! I would recommend this product to anyone. 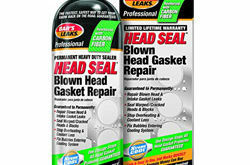 Gasket heads cost as little as $280 and as high as $600. I am also talking about $1200 to $4000 parts and labor cost in tearing your engine apart to find out the cause of your car’s leaking radiator or engine overheat.